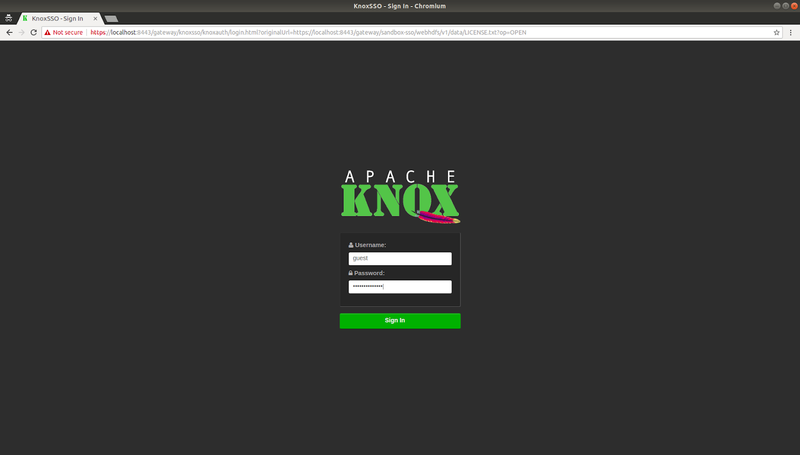 This is the fourth in a series of blog posts exploring some of the security features of Apache Knox. The previous couple of posts looked at authenticating to the (REST API) of Apache Knox using a token, obtained from either the Apache Knox token service or a third party JWT provider. Authenticating using a token works well when we have a client application invoking on Apache Knox, but what about if we want to use a browser instead? In this post we will look at how to achieve single sign-on using the Knox SSO service. To start with, follow the first tutorial to set up Apache Knox as well as the backend Apache Hadoop cluster we are trying to obtain a file from. There is no need to create a new topology file in Apache Knox for the Knox SSO service, as it already ships with a "knoxsso.xml" file. Note that it contains a "KNOXSSO" service as well as a "knoxauth" application. The idea is that the user first browses to the Knox topology secured with a special provider that redirects the browser to the Knox SSO service. The user then authenticates to the LDAP backend using a form (knoxauth). The Knox SSO service then issues a cookie that can be used to access the desired service, and redirects back to the service. Authenticate to Knox SSO using the LDAP credentials "guest" and "guest-password" and click on "Sign in". A cookie will be created and the browser redirected to the original URL where "LICENSE.txt" can be downloaded.